I may have finally nailed a performance issue that I have been having with FireFox for a while now. I keep updating and hoping that it will go way. While I am using the browser, it stops responding for a second or two periodically. When the system is really loaded, it gets even worse. I spent some time lurking around the web looking for solutions. I have tried disabling some things. I have tried lots of stuff. Today, I was getting even more frustrated and tried searching again. In the past, I was running into trouble with the Google toolbar's start screen. It turns out that there is, or at least was, a bug where the SQLite DB would grow and grow. The system would keep updating it. As the DB grew, your profile would get huge and each update would take longer and longer. My TimeMachine backups were huge. I would have 250MB of changes in seconds. If I ran a backup and then immediately ran another backup, whammo 250MB. I decided to find out what was being backed up during that period of time. I found and tried Grand Central. Grand Central provides a view of the file system based on disk usage. Files are graphically displayed sized in proportion to their size on disk. Once the system spent a little while churning on the disks, I could see what file was taking up most of the 250MB. There were many many large blocks that included places.sqlite I believe. Googling for this resulted in a description of the FireFox slowdown I was having, along with an easy fix (download the SQLLite manager and truncate the right table). I have also turned off the Google start page which avoids the problem all together. Today, I was getting more and more annoyed with my current slowdown. It is not as bad as the other one (30 seconds of beach ball of death, 5 seconds of work, rinse and repeat). I have noticed that the system writes and reads from the disk quite a lot but I have not been sure what it is doing. LSOF is a difficult way to catch something that transient. The new slowdown is a fraction of a second complete pause in FF. Depending on system load and CPU it might be more or less often or slightly longer. I actually thought it was Flash missbehaving at first. Anyways, in today's search for FF pauses, I found a website for an ISV: http://forums.whirlpool.net.au/forum-replies-archive.cfm/836951.html They talk about pauses and mention monitoring the file system with fs_usage several pages down. I tried this and was flooded with file system messages. Lots and lots of messages. FF was one of the major contributors. I piped the output to a file and tried using tail in another shell to monitor the disk activity. Unfortunately, tail was causing a flood of messages of its own. Way more than the actual traffic. Without tail, it was hard to figure out what was happening. The biglog file was 150MB and many of the commands and filenames were chopped. I tweaked the parameters to fix that '-w' and hone in on FF. I quickly disabled the add-on and restarted FF. Once restarted FF no longer exhibits the issue that I was seeing before. While writing this article, I looked on my disk for the file. I wanted to see how big the file is/was. I could not located it. I also could not locate it on the backup. After finding the documentation for the Gears API, I was able to locate the files. Thanks to Google for documenting all of the file locations for every OS and browser combination. All of the files are small. I am not sure why the journal would be big, but it is gone now. I don't know how big it was and I cannot find the file in TimeMachine. This reasonable amount of disk activity did not cause the browser to hiccup at all. I am impressed, I thought the system was very susceptible to HDD activity based delays. It might have been only HDD activity was slowing down the blocking HDD activity the browser was trying to get done. 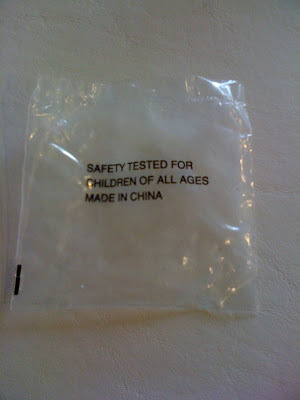 Although, to be honest, I hope they did not test this with children of all ages. 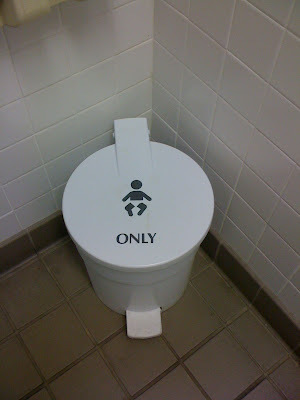 If you have ever had a really frustrating day at the Monterrey Bay Aquarium with inconsolable kids, you might appreciate this trash can. That being said, I definitely support hospitals and fire stations as a much better option. I was rather impressed with the effort that Costco went through to post multiple kinds of trash, recycling, and compost bins throughout the local stores. Go Costco!!! 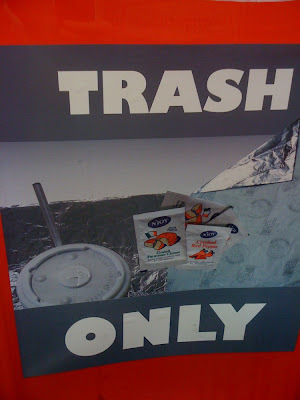 I was rather surprised to see the plastic lid from a cup to be included in the trash picture. A quick check verified that you can see the recycling symbol in the picture and they use recyclable cup lids. 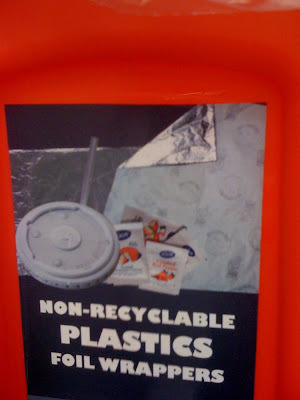 Not sure why it is called "Non-recyclable plastic". - spell checkers should definitely work on titles. A long long time ago, in a galaxy far away, I had a group of friends that I used to hang out with. We spent a lot of time together and did tons of stuff. One of the guys was really big, moved a little slow, had asthma, had epilepsy, and used to threaten me all the time. That was kind of his shtick. He never hurt me in any way. He just used to threaten me. I never thought that he would hurt me, but it was still a bit unnerving. In fact, it frequently kept me on edge. One day, we were driving off to go somewhere. I am not sure what we were talking about but the phrase "kick your a**" came out of his mouth. I yelled to my friend to stop the car, said I was sick of it, and got out. After realizing that I was serious, and done, many apologies quickly ensued. True to his word, he never threatened me again. Not only did he not threaten me again, we actually started talking. We had some very interesting conversations while the others were occupied with other things. I am not saying that they were terribly deep. We did not cure cancer, but we were way past the weather. Have you ever had that feeling that you have really connected with someone. It actually does not take too much, IMHO. You just have to start a dialog on something real, not something trivial or banal. This does not happen as often as one tends to think. When was the last time that you actually sat down and talked with your spouse? What have you either not been honest about or not been upfront about? (more on this topic later). What would happen if you made the time to actually talk. Through the months and years that followed, we actually looked forward to our time together as a chance to talk. We never spoke about the talking directly, we just hopped into things anytime we were near each other. I had not realized how much he also enjoyed our conversations. You are probably asking, "What is this, some kind of feel good blog entry?" I am glad you asked. We were boys. We were teenage boys. We were in fact, several teenage boys. What do you think happens when we get together? What do you think happens when subsets get together? Well, naturally there is some teasing. As you can imaging, the large asthmatic epileptic person was teased a bit too. I even initiated some of it. He was proud of his heritage and would frequently say that he was "half Mexican." One day, when we sat down, I told him that they knew he was coming. "Why?" he asked. Because they put half and half on the table. I tended to restrict myself to things that people were comfortable about so that they would not get hurt by the teasing. I assume that joke did no lasting damage. The others tended to tease a little bit more than that. 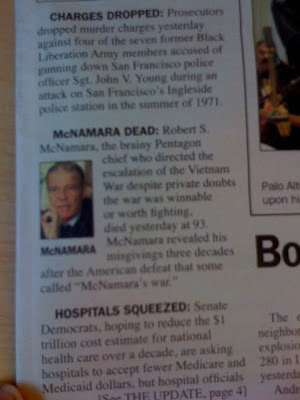 Jokes about his intelligence and seizures (which I never witnessed) were rampant. I am ashamed to say, that I went along with the flow. I even pretended to be entertained. The jokes were pitiful and tired. But I did not stand up for our friend and worse, by pretending to be entertained I was reinforcing them. I would pay for these mistakes later. One day, I heard from one of our mutual "friend" a little story. It turns out that B mentioned that he missed our conversations together and that he looked forward to them. Given that those conversations were only between he and I, I think a little jealousy might have come to the fore. Our mutual friend, whose friendship spanned a few decades, decided to say that I made fun of B. That I laughed at his illness and his thinking that he was intelligent and at our conversations. This would be the last conversation that I would have with our mutual "friend." He took something so beautiful which was found in such an unlikely place. A space for calm, reflection, peace, and comfort. Never mind the fact that B was a teenage boy that had some things stacked against him to begin with, and rip B apart in such a way was one of the most offensive things I have ever heard of. He laughed when he told me. This time, I did not pretend to be amused but I feel the damage was already done. B.R. I am sorry. I miss our conversations. They were some of the best ones of my middle school and high school years. I hope you can forgive me for going along and not sticking up for you. I hope you have come to realize that I really cared about you and value our conversations for what they truly were. Stand up for what you believe in today. You may not be there tomorrow. They may not be there tomorrow. Windows close all of the time. If you have the chance, let them know that you care. Tell them the truth. Don't be afraid to have beliefs, feelings, likes, and dislikes. Everybody does, they just don't stand up and talk about it. Many of you know that I love my Kindle. It is like a small lapdog. I am carrying it everywhere and it occasionally draws attention to itself. 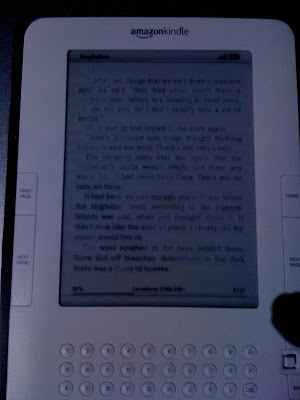 I have run into some issues where the Kindle has rendered poorly though. It reminds me most of when an ink jet printer is running out of ink or has clogged heads and the text is really faint and grainy. Now, for an ink jet printer, I can understand this. For eInk, I am a little confused. When the symptoms would happen, I would flip pages backwards and forwards for a while trying to clear out whatever it was that was making the image blurry. It usually cleared up in a few flips of the page and I would go back to reading. Sometimes, I would read it while it was still blurry because it was being particularly resistant to clearing up. This issue nagged and nagged at me. I don't like to leave problems without finding a reasonable cause for why they happen. In the software world, I have found that if something breaks once, it will break again. Typically, it will break in the same way at multiple locations around the world almost simultaneously. Ignore software problems at your own peril. Since I could not reliably reproduce the problem or make it go away, I figured there was some issue that was affecting its performance. 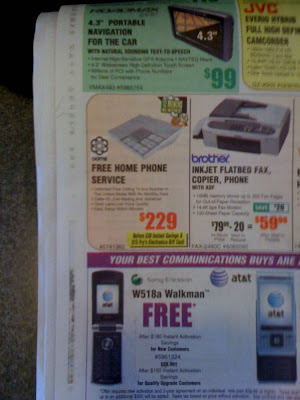 I considered several factors: ambient temperature, duration of use, speed of flipping pages, ... I started to pay far more attention to the problem when it occurred and looked for patterns. I noticed a few patterns right away. The problem was not consistent throughout the screen. Any part of the screen could be affected. Usually a large portion of the screen or the whole screen was affected at one time. I was frequently on the move (either walking, in my car, waiting in line, ...). While this made me even more suspicious about ambient temperature, I noticed that cold or hot days did not make a difference. One day, I was holding the device in a way that covered part of the screen, flipped the page, and figured out the pattern. The portion of the screen that I was covering was bright and vibrant and the rest was affected by this issue. I quickly determined that it was UV rays that were affecting the image. My Kindle is sun sensitive. 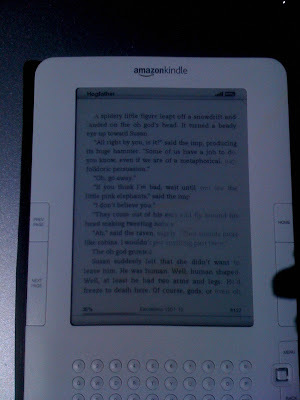 Now, I am sun sensitive and this would explain why the Kindle would only act up when I was on the move. Most of the time, I was either out of the sun or behind UV protected glass. 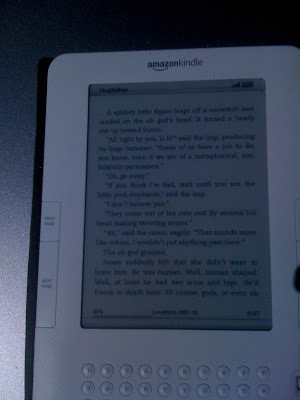 For this blog entry, I took a few moments with my car parked out in the sun and took some candid shots of my Kindle. (I hope it has a nice modeling career ahead of it). 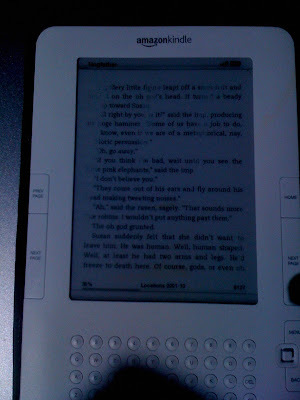 I started out with rendering a page on my Kindle inside my car (UV protection in the glass). You will notice that the Kindle image is very sharp and quite easy to see even in the direct sunlight on a bright California afternoon. 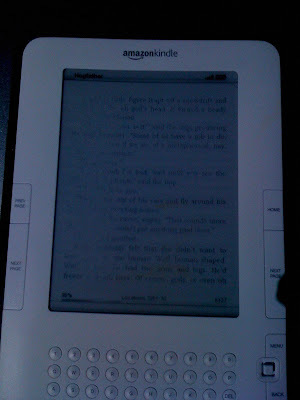 You can see how blurry the kindle is. How much of the text is completely missing and you cannot read much of the page. After that, I thought about a few ways that I might convince and/or show people that this was indeed the issue. One bad render could easily be caused by a temperature difference. A temperature difference could be caused by say, pulling the Kindle out of a car and putting it on the hood on a nice bright California afternoon. While the Kindle surface is a little bit small for this exercise, I tried a few attempts at making patterns on the screen by shading it with my hand. 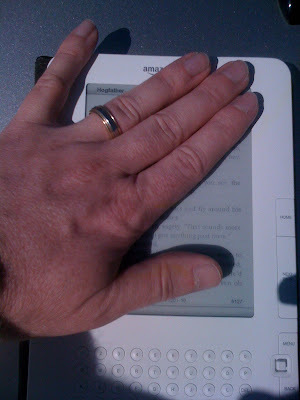 In order to have sharper lines on the display, I placed my hand directly on the device while I flipped pages. Here are two different patterns with before and after shots. Look near where the edge of my hand was and see how big the difference is between the shaded portion and the non-shaded portion. 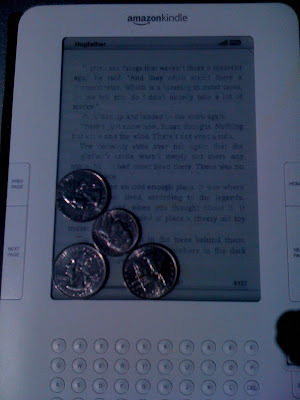 As a final experiment, and more detailed pattern, I decided to stack some coins on the corner of the Kindle. My Prius hood is a little too steep for them to sit in the middle, so I stacked them up in the corner of the screen. Unfortunately, 2 pennies would not have been a very good example image, or I would have shown you my $0.02. You can see the influence of the coins, but the pattern is a little blurry. Some of the coin edges are visible but they are not too crisp. I have to say, the Kindle does not quite live up to the advertising in this case. It does have glare, it is not bad, but it is there. Also, while you can read amazingly well in bright sunlight, you cannot read after turning the page. I turn lots of pages. I have tried this on at least two kindles (one original, one Kindle 2) and have seen a consistent issue. 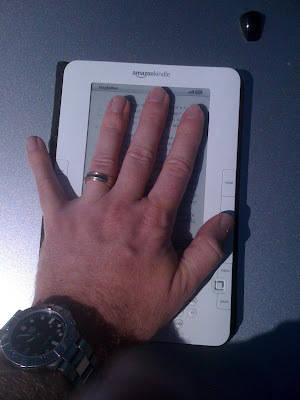 I have to say, for a device that is dedicated to reading, not being able to read in the sun is a little disconcerting. I think an inexpensive UV filter over the screen would both protect it and prevent this from being an issue.